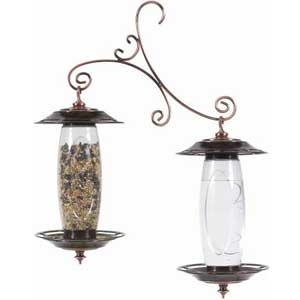 Acrylic version garden sip & seed feeder. Decorative bronze finish with copper accents. Unique, patented application. Opposing silos that hold both seed & water. Cap & base are interchangeable so each silo can serve either seed or water. Holds 1.5 Lb. of seed & 27 Oz. water. Gift set type package. 2 feeders/waterers in one package.